Despite a mind-boggling population of 24 million, Shanghai seems like a questionable location for a custom bike shop. Chinese laws make it expensive to register imported vehicles, and the bigger the capacity, the harder it gets. Still, this hasn’t deterred Kiwi Matthew Waddick and his crew at Shanghai Customs. 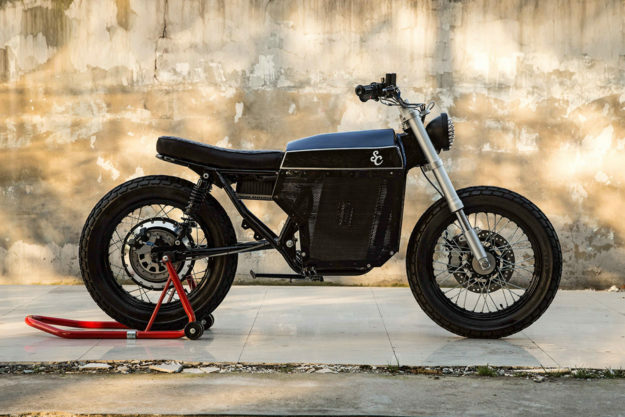 When they launched three years ago, their focus was small capacity, gas-powered customs. But as restrictions have become tighter, they’ve gone electric. 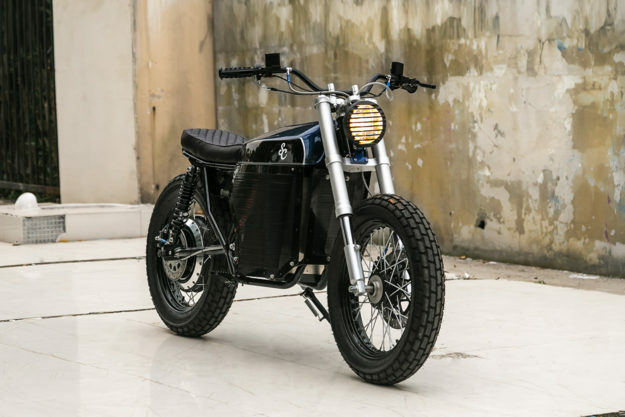 The guys are still building a few petrol bikes a year (there’s a SR500 and a CB400 on the bench), but a big part of their daily grind now involves electric bikes. 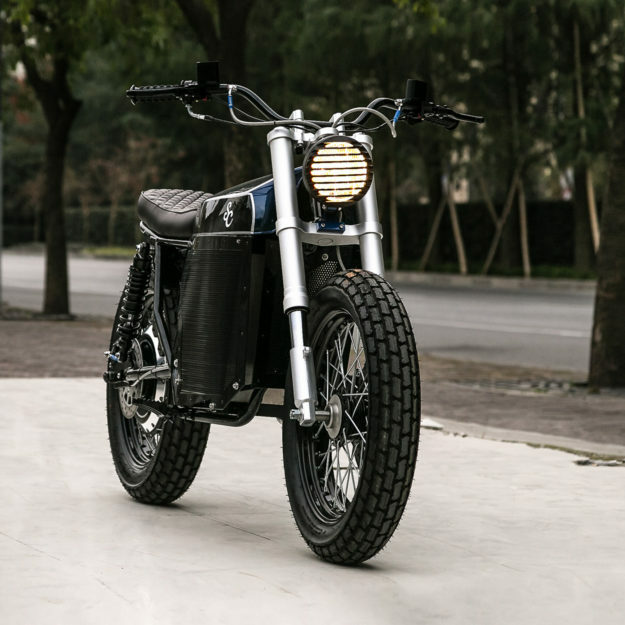 Shanghai Customs also have two production models in the works: an electric scooter, and a petrol bike that’s being made for the export market. 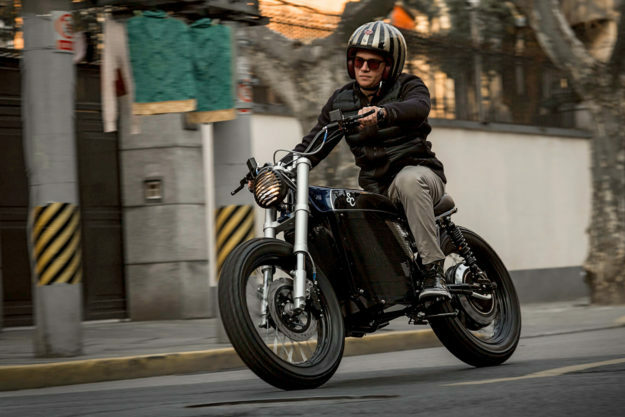 In the midst of all that chaos, they’ve somehow found time to build this prototype electric street tracker. 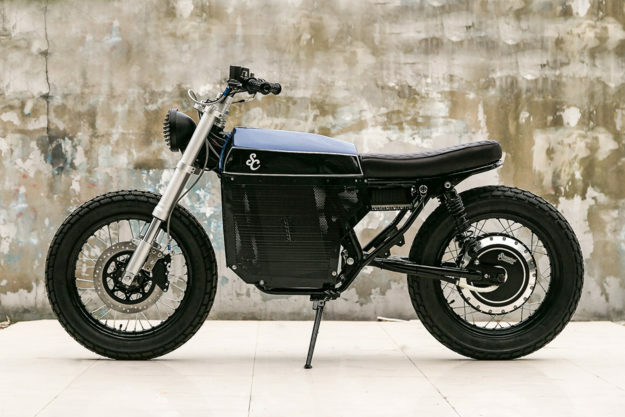 At a glance, it looks like the perfect urban runabout. But what’s really striking is that it cuts a similar silhouette to, say, a Yamaha SR. A completely intentional move on Matthew’s part. 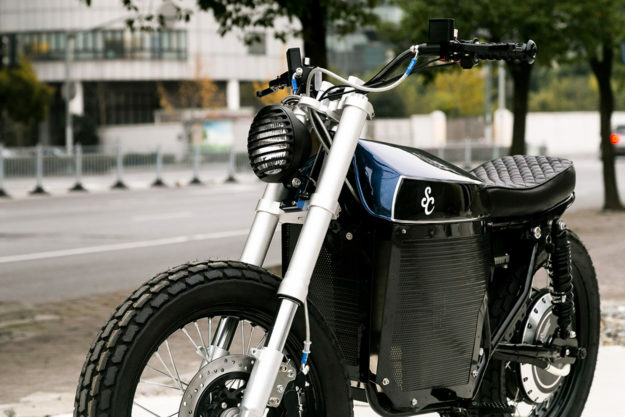 Here are some numbers to chew on: the bike can do 140km/h, and has a range of 250 kilometers. The battery’s a 72v 80amp Lithium-ion item, the brain is a 400amp controller from Kelly, and the motor is a 5000w hub-mounted unit. So how did Shanghai Customs build it? With a network of suppliers that they’ve spent a considerable amount of time compiling, and an app called WeChat. The first part to get done was the frame: Matthew designed it, then had it made in a Chongqing factory. 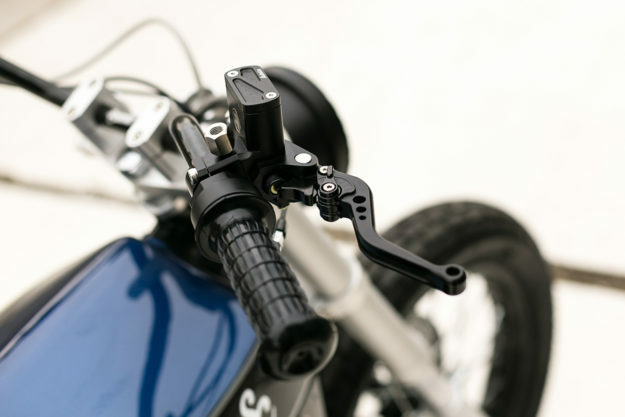 While that was happening, another factory modified a retro swing arm to fit the hub motor’s axle. Once that was sorted, the swing arm went off to the motor factory, so that the engineers there could adapt a 5000W motor to align perfectly with it. Finally, the motor went to the wheel factory, where it was laced to an 18” steel rim. 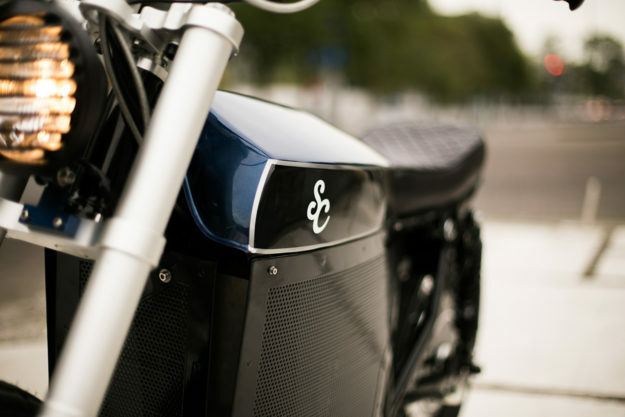 Shanghai Customs decided to use imported batteries for the bike, sending them—and the frame—to a facility in Shenzhen to pack and mount. The batteries easily form the heftiest component on the build; they’re the same ones used in hybrid cars, and weigh in at 55kg. A custom stainless steel box holds the auxiliary bits—like the battery management system. The controller itself is produced by Kelly in Anhui, and is programmable via an Android app, which also provides all sorts of performance data. With everything installed, Matthew set about making it pretty. 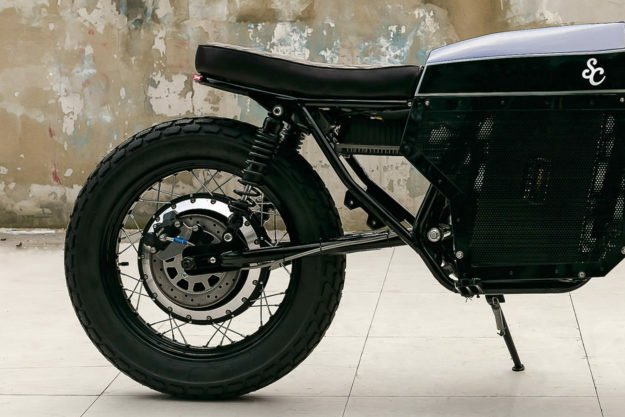 He fabricated side panels out of sheet metal and mesh, adding some curvature to the overall chassis and tucking away the techy bits. 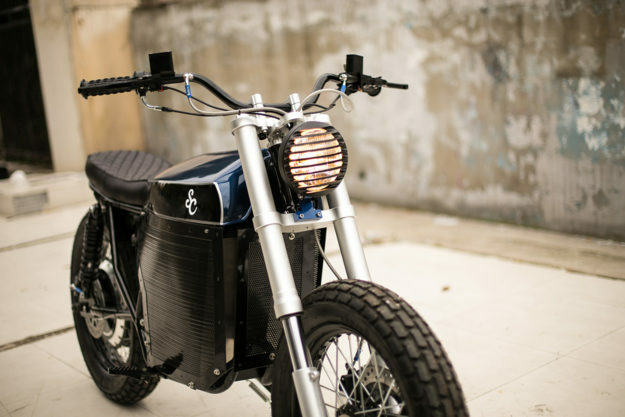 The tank’s made from sheet metal too—by a workshop in Guangzhou—but serves only to cover the top op the battery. The other parts have come from all over the place. 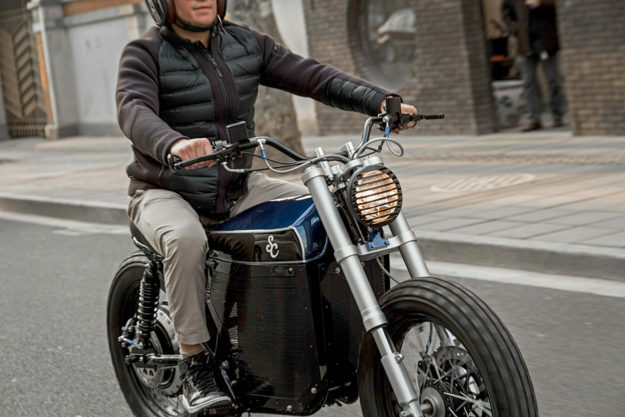 The aluminum yokes, upside down forks, rear shocks, bars, levers, the LED taillight and brake discs are all prototypes supplied by various factories. 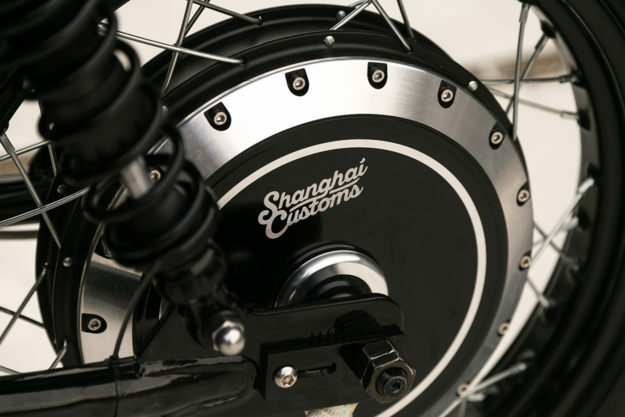 Shanghai Customs plan to roll some of these parts out for both electric and petrol bikes in the future. When it does hit the streets, would you put it on your shopping list?